This is quite an interesting game type as it comes closest to fiction writing. Some of the series such as ‘Dragon Lance’ have been written based on the outcome of game sessions. These games are entirely about storytelling and imagination. The game creates a setting for the players and the players jointly create a story in the world. In some ways, the result can be more realistic and interesting than a story by a single author since the story has perspective of 5-6 people in it. The only game of this variety I have been exposed to is Dungeons and Dragons. That too I have played only 2-3 sessions, not an entire game. But I have read the guidebooks that come with the game and I also procured 2 dummy’s guide books to these games, both of which I gifted away to a friend without reading fully. However this concept has really fascinated me and I would like to try it sometime if I have the time and right set of people. 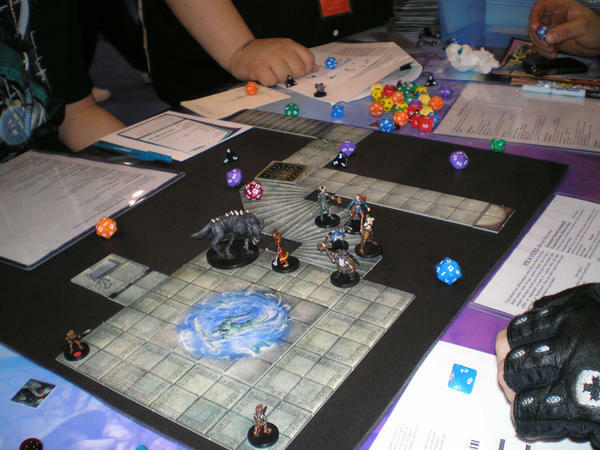 Dungeons and Dragons is typically a physical game that does not require any IT interventions. But then it needs various kinds of dice, stationary, maps and few other things. I think a computer program can provide all these things virtually in addition to giving opportunity for players to connect remotely. People have told me of science fiction and fantasy games based on story telling other than Dungeons and Dragons that work that way as well. So let me get started with Dungeons and Dragons. Basically the crux of the game is the world rules. The game provides the following basic things – maps, race and class profiles, rules of encounter, Gods, economy guidelines and levelling guidelines for each class. Of course there is much more literature available around the game but these are basic things to get started. Let me explain each one of these. Maps provide the lay of the land of the fantasy world where the story takes place – the stories typically tend to be quests where players travel over different lands to accomplish something like Frodo’s quest to dispose of the ring. Races are the ones like humans, elves, orcs, dwarves etc. The profiles mention basic characteristics of the race such as their physical strength, innate magic power and other abilities and other things such as their basic alignments. Alignment is another interesting concept – they have two types of alignment – one moral alignment – good, evil or alignment. The other alignment is around discipline – chaotic, neutral or lawful. Every race has a basic alignment as does a class with some flexibility to choose alignment for a specific character the player is designing within certain parameters. Then we have classes such as priest, monk, sorcerer, rogue, knight etc. These are something like professions and each class has some specific set of skills. The guidebook has detailed description of each class and the various levels which are like skill levels. One gains levels as one plays the game and makes progress. A player also has option of developing multiple class skills or going higher in one class. Similarly in terms of race too, player can choose to be a hybrid. At a broad level, the classes can be grouped into warrior, magician or a trickster – typically most heroes in stories are one of these. The rules of encounter and levelling form part of basic game play. Before we get there, let me describe the basic game structure. Usually the game has 6-7 players. One player is called dungeon master. He must be an experienced player and he usually controls the world and secondary characters, most of whom will be antagonists. Each of the other players creates characters with an alignment, class and race. They all from a group and go on a quest in a world whose behavior is controlled by the dungeon master, who is bound by game rules and basic logic. The players encounter various obstacles which may be solved by the player’s different abilities – intelligence, strength, magic, charm etc. The abilities depend on the class, race, level etc. The dice introduce the luck factors in the encounters. Often there are situations where players just need to talk their way through, take right decisions or solve puzzles set by the dungeon master. At the end of every session, the dungeon master allocates points to every player. If a player collects certain number of points, he can level up and acquire new skills. So overall, the dungeon master controls the events in the world and the players control character reactions to the event with a luck factor not controlled by either. The fantasy world and its rules are of course already created. Together they create a story on the go. For the players, it is an interesting experience of being part of a story real time. It can be a very exciting experience. And from a writer’s perspective, it can present a refreshing change from the usual clichéd storylines as it involves the mind of 5-6 people and real time reactions to situations. Looks like the game play can also give you insights into how different characters will act/react under the same stimulus. Yeah. That is the fun part. And it can be totally unpredictable as if you are in a real adventure if you have good dungeon master and good fellow players. Hmm that way a computer game would dominate on a comparative scale as one would not need to read or remember so many rules right ? Yeah - but computer games tend to be simplistic and don't let you build stories real time.The remembering rules I feel is really helpful if you are a high fantasy writer - you need to make rules like this in order to write that. Karthik, it is certainly a novel idea and I agree there is a base to your conviction that the perspectives of different minds might create a richer story. You have certainly made it interesting with the way you have put it all. Who knows I might me tempted someday! It is really worth it. With your rich imagination, you would be an excellent dungeon master. Had never known of this game before. Yeah - I have been fascinated by this game ever since I came to know of it.